Twitter’s decision on controversial Infowars founder Alex Jones didn’t stand for very long as the social media platform buckled at the knees and decided to temporarily ban Jones’ activity on it’s website on early Wednesday morning. Apparently, Twitter CEO Jack Dorsey’s tweet-thread last week defending his company’s decision not to ban Jones was merely a polite suggestion, because in the middle of the night — much like when Apple, Facebook, YouTube, Spotify and other platforms banned Jones — Twitter made the decision to suspend Jones’ Twitter activity for seven days. Jones will be allowed to read tweets, but nothing else. “We haven't suspended the account but are requiring Tweets which contained a broadcast in violation of our rules are deleted,” a Twitter spokeswoman told Fox News. 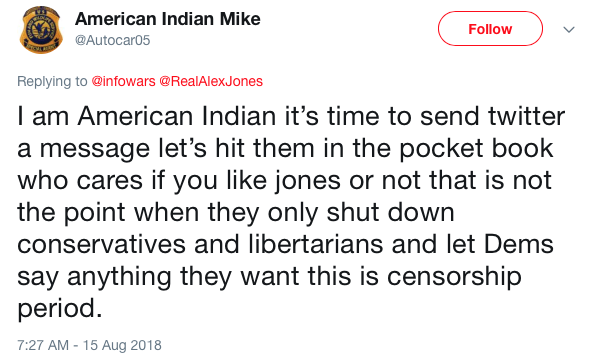 Early Wednesday morning, Jones responded in a 13-minute video that was posted to the Infowars Twitter account, in which he suggests that Twitter told him they would shut down his account if he's found to be in breach of its rules again. 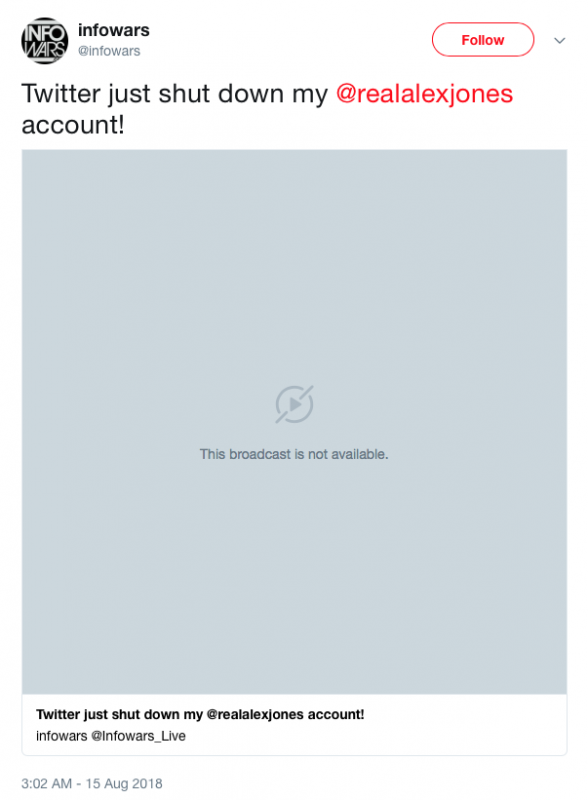 Periscope is owned by Twitter, hence the action by the social media giant. It’ll be interesting to see what happens when Jones’ temporary activity ban is lifted next week. Will Jones push the envelope and make the decision easy for Twitter, or will Twitter take action without substantive provocation? Only time will tell.